ARLINGTON — There is only one way to describe the weather here in Texas — HOT. 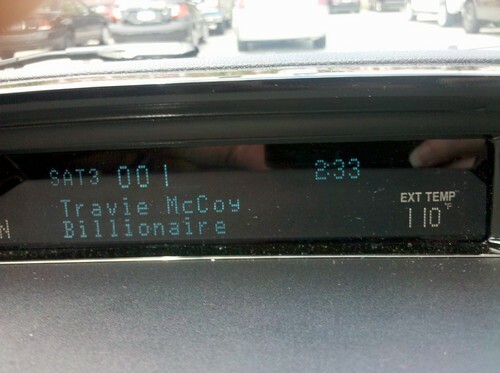 As you can see in the picture, when I drove to the ballpark today the temperature in my rental car read 110 degrees. So yes, it will be a steamy one tonight when the Twins square off against the AL West-leading Rangers. The Twins did not get good news from the MRI on Ron Mahay’s right shoulder today. Mahay has a torn rotator cuff that he suffered in the awkward fall he took in Saturday’s game when the lefty stumbled off the mound trying to field a squibbler in the infield. It’s not Mahay’s pitching shoulder but he could need surgery to fix the problem and that means his 2010 season may be over. The Twins are still determining their next course of action for Mahay. Better news for the team when it comes to Kevin Slowey, who just has a mild strain of the triceps muscle in his right arm. Twins manager Ron Gardenhire said that the MRI on Slowey’s right triceps didn’t show too bad of a strain so that’s positive news. But they’ll take their time with Slowey’s recovery as they’ve got two weeks while he’s on the DL.